Boston Whaler is pleased to introduce the all-new 380 Outrage, a powerful vessel that confidently navigates the spectrum of on-water activities. For epic offshore runs or memorable social gatherings, the 380 Outrage is incredibly comfortable and easy to operate. Count an array of user-friendly amenities, sophisticated storage solutions and Boston Whaler’s precision-engineered V-hull design to provide unsurpassed performance and endless enjoyment. 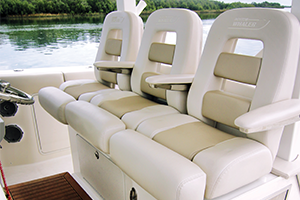 There are numerous features that make the 380 Outrage a standout. For entertaining ease, the optional Summer Kitchen includes a grill and refrigerator/freezer, plus storage for all your snacks and essentials. The air-conditioned cabin with a convertible settee/V-berth provides an inviting place to duck out of the elements, enjoy a meal or stay overnight. For anglers, fishing features abound: Look to the standard 60-gallon transom livewell, the well-equipped leaning post, an integrated hardtop with rod holders and large in-floor fish boxes to keep you on top of your game. The optional Upper Station with advanced helm provides fishermen and pleasure boaters alike with stellar views and confident command. And there’s no shortage of space to spread out and relax. The cockpit features a new aft-facing couch with optional table and a convertible aft bench, plus an electronically-deploying sunshade option. The spacious bow includes a plush lounge (with cavernous storage below) and its own optional sunshade. The 380 Outrage is also a champion offshore performer, delivering a remarkably soft, safe, dry ride. 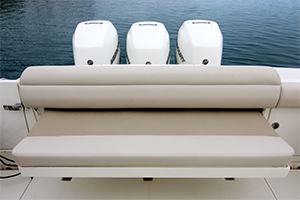 Triple Mercury® Verado® engines with optional Joystick Piloting provide strong, reliable power and effortless docking. But that’s only the beginning! 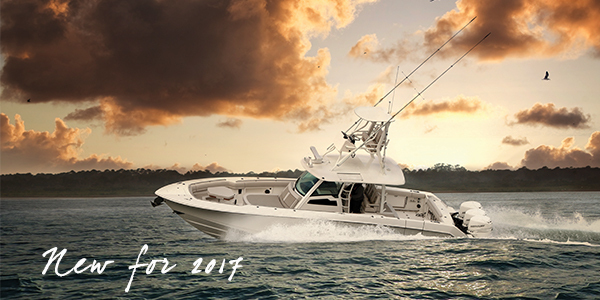 Click below to receive our 380 Outrage digital brochure and take a closer look.